Antique Radio Forums • View topic - Ebay seller misrepresenting Crosley Fada bullets? Ebay seller misrepresenting Crosley Fada bullets? Post subject: Ebay seller misrepresenting Crosley Fada bullets? 48 bids! Wow! And it sold. Hope he doesn't get hit by the Ebay police, but he does have like 99.% pos. feedback. Post subject: Re: Ebay seller misrepresenting Crosley Fada bullets? Looking at the first listing, I can't see that the seller has misrepresented anything about this radio. Seems to me that it's primarily incumbent on the buyer to understand what he/she is bidding on. Although I don't know how "vintage" or "old" you can consider them, he is describing them as "Crosley Collectors' Series" sets, which is what they are.... Maybe some view these as a chance to have a Fada bullet-esque radio without breaking the bank. They get the "vintage" styling PLUS the versatility of AM/FM/ cassette (cassettes are pretty useless today, and AM radio is quickly following suit), and the reliability of SS. I personally wouldn't want one, but personal taste is just that - personal taste, and some people have more money than taste IMHO. That being said, he is definitely walking a very thin line with his description (which shows his lack of moral character), but it is still up to anyone bidding on his - or anyone's feepay items to do their due diligence, know what they're bidding on, and if not, ask questions. Anyone that has been looking into Fada bullets to purchase should know they weren't FM, didn't have cassette players, and didn't have screen printed fiberboard backs - the fact these are CROSLEYS and NOT FADAS notwithstanding. "You're my family and I love you, but you're all terrible!" Last edited by andyjon100 on Mar Mon 05, 2018 8:44 am, edited 1 time in total. Ahh yes, our old pal radios 10467, and true to form, it's interesting that bidder j***d (41), who's goosed the bid 7 times, has an 84% bid history with him. THIS IS THE RARE VERSION WITH YELLOW CASE AND RED TRIM AND SCREAMS OF MOTION WITH A COOL ART DECO STYLE . THE RADIOS EXTREME ART DECO STYLE REFLECTS THE PAST BYGONE ART DECO ERA OF THE 1930s AND 1940s . THIS RADIOS CONDITION IS GEM MINT , AS GOOD AS IT GETS . NO CRACKS CHIPS OR BREAKS AND RETAINS ITS ORIGINAL REAR COVER . THE RADIO RETAINS ITS ORIGINAL FACTORY SHINE . WHEN TESTED THE RADIO WAS STILL PLAYING WITH GOOD SOUND AND TUNNING MANY STATIONS , BUT SOLD WITH NO WARRANTY , THEY ARE OLD AND FRAGILE AND I DO NOT RESTORE RADIOS . DONT LET THIS ITEM SLIP BY , THEY DO NOT COME UP FOR SALE OFTEN . Kinda makes it look like a real authentic antique, don'tcha think? By association, it may sound like a description of a "real authentic antique" but "looking like" an actual antique is another matter. The radio photos in the auctions under discussion are crystal clear and not even remotely deceptive. You'd have to be pretty naive, substance-addled, or just plain stupid to believe that what you were bidding on was anything but a Chinese-made repro radio. Exactly, par for the course. I've seen 2 negative feedbacks on him saying he lied by omission. I.e. - not mentioning it's cassette feature nor that it's a "reproduction" like he should have? I wonder if those people got restitution via the buyer protection program? The radio photos in the auctions under discussion are crystal clear and not even remotely deceptive. I have always wondered, if I posted ONLY clear photos, but purposely left out information in the description..would a buyer have a case against me? - It tunes AM and FM. - It has an eight-track player. - The decals on the back say "made in China". Somewhere, somehow there has to be a balance between blaming a seller for misrepresentation (pretty minimal in these two cases) and realising that the people who buy these things are adults and they need to at least try to pretend that they are adults, making adult decisions for themselves. I have no sympathy at all for anyone who bought these thinking that they were antiques. There is an entire internet out there filled with information that these people can use to self-educate before they make decisions about spending their money. Maybe they should try using it. 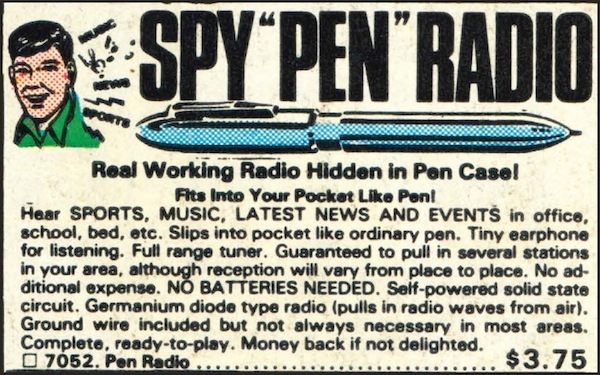 His auctions remind me of the old spy pen radio ads that used to be in the back pages of some magazines 40+ years ago. They were very carefully worded to not to actually lie but not to tell the whole truth either. The ads whipped up the enthusiasm in a lot of young kids but not their skepticism. It wasn't until they received their much anticipated spy pen radios did they realize the dark truth about what they bought. I wonder if the seller got his inspiration for his Fada auctions from ads like this. 2. It's under the 1930 to 1949 category when he SHOULD have posted it under "Other collectible radios"
This dude likely will suffer the consequences of an "item not as described" case against him. Giving the seller the benefit of the doubt (whether it is deserved or not, based on his (unknown to me) prior history of questionable transactions), miscategorization could be explained as a simple mistake rather than intentional deception. It's a plausible excuse, even if the miscategorization was planned. At any rate, even the most cursory of examinations of the auction would reveal the true nature of what is being sold. I don't think that it's a sure thing that the eBay complaint department would come down on the side of the (exceedingly foolish, IMO) buyer. This might be written off as a case of "buyer's remorse" and the claim denied. Actually, Ebay is very well known to take the side of the buyer OVER the seller when cases are opened against sellers. I see complaints by sellers all the time how they are unfairly treated when they even know they did describe the item succinctly. As to whose side eBay would take in a dispute could easily be guessed, but I suspect this notorious seller keeps his feedback high by offering returns when a buyer isn't happy. That guy could sell ice cubes to Eskimos. They didn't cost that much when they were new, and weren't worth what they originally sold for. Then it follows that there is no real problem. If everyone is happy at the end of the day, who cares? The dimwit bidders have been avenged, the gods of e-commerce have been appeased, and the seller lives on to peddle his wares. This is an auction. Nobody is forcing the bidder to bid. Both the seller and the bidders are adults. The pictures are clear. The unit is so obviously not a tube set and not an antique that anyone attempting to file a claim of misrepresentation against this seller is being as fraudulent as some think the seller is. A person who bought this genuinely thinking it is an antique is simple-minded and shouldn't be walking about on their own. Are we intelligent, competent adults or not? I agree with you John. When I lay down that kind of cash for something, I make sure to educate myself as much as possible first. You never know though - that may be genuinely what they want. And pictures can lie. Some time ago I won a Harman Kardon Citation III-X FM stereo tuner. It looked very good in the pictures, but when I got it it looked much older and dirtier. It was apparent he had photoshopped the lighting and contrast to make it appear shinier than it actually was. I got a good price for it, so was only mildly perturbed, but at the same time I don't like anyone trying to fool me any more than the next guy. 'Buyer beware' is always good advice. The pictures are clear. The unit is so obviously not a tube set and not an antique that anyone attempting to file a claim of misrepresentation against this seller is being as fraudulent as some think the seller is. yes, it may be painfully obvious to us, knowledgeable old timers who collect these and can recite the tube compliment in our sleep, but to younger generations, most wouldn't have a clue of tube vs SS, or when FM radio broadcasting or cassettes began to appear. Radio 10467's description is very clearly bogus as far as we are concerned, but he's not selling to our demographic.